This deeply engrossing and sophisticated Japanese novel unpeels itself in multiple nested narratives over its 855 page length. 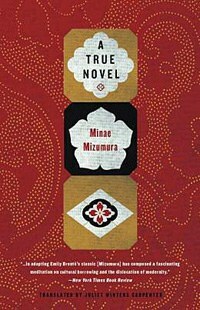 If you have heard of Minae Mizumura’s A True Novel at all, it's likely for one of two reasons: Either because it has been loosely inspired by Emily Bronte’s Wuthering Heights (Mizumura makes a reference in the beginning of the novel to “the desire to emulate being the basis of all art”) or because of its unusual structure. A True Novel is a “nested” novel which, over its 855 pages, unpeels like a giant onion. There never seems to be a clearly delineated point in this narrative -- which centers on a grimly self-made Japanese man, the handsome and Heathcliffian, Taro Azuma -- when the story actually “starts”, in the way one expects a traditional novel to begin. In fact, the novel commences with a 165-page prologue by a fictionalized version of the author, who positions the story she is about to tell as “true” and introduces the reader to Taro during the period when she knew him, as a chauffeur working in the US in the '60s. The story of Taro’s life before and after this period is recounted to her by a literary editor named Yusuke Kato, who in turn was told the story after an accidental meeting with Fumiko Tsuchiya, an impoverished woman who became the maid and nanny of the Japanese family that took Taro in when he himself was a bedraggled and bullied little boy. The accident occurs during a rainstorm, when Yusuke crashes his bicycle on his way to the Japanese vacation destination, Karuizawa, to meet a friend, and instead ends up spending the night at the run-down cabin outside of Karuizawa that Fumiko shares with Taro in their latter years. The story that follows, narrated by Fumiko through the filter of Yusuke’s memory, centers on Fumiko, Taro, and Yoko, the Cathy-like young woman with whom Taro grows up, loves, is rejected by, and, after her marriage to someone else, has an affair with. Fumiko’s own relationship with the younger Taro is somewhat ambiguous through most of the story, and while reading those portions of the narrative indirectly narrated by Fumiko, one would do well to bear in mind that, in Japanese novels just as in Western ones, the narrator is not always to be entirely trusted. The story of these three characters is itself nested inside an extensive family chronicle tracing the history of the relatively wealthy Saegusa family, of which Yoko is a member and which took Taro in as a sort of ward and servant, and the more-aristocratic Shigemitsu family, which Yoko marries into. And this family chronicle, in turn, rests inside a still-larger narrative of post-war Japan (and to a lesser extent, the post-war US) and, in particular, the class divisions that caused Taro to become first impoverished, and then driven, wealthy and, ultimately, embittered. The ultra-long prologue is highly artificial in structure, contriving as it does to allow the “Minae Mizumura” character, who has no strong connection with Taro, to encounter him or hear about him numerous times before she finally meets Yusuke, who is her entrée to the stories of Taro when he was young, before she knew him in the US, and also when he and Fumiko are old. And yet Yusuke’s own “prologue”, telling of his bicycle accident and his meeting with Fumiko and Taro in the cabin, takes another 135 pages, before Fumiko begins the actual story with the words, “I’m afraid there’ll be a lot of digressions.” So many, in fact, that Taro as a child, hollow-eyed with hunger, isn’t properly introduced to the reader until page 430; it could be argued that this, in fact, past the point where most other novels end, is when the novel really “begins”. If this sounds like a criticism, it's not. It's fascinating to watch the structure of this novel calmly unpeel itself, and to reflect upon the patience with which Mizumura reveals the truth about the interrelationship among Yoko, Fumiko and Taro. Taro himself, though inspired by Heathcliff, is a fascinating and enigmatic character in his own right, and his journeys between America and Japan, and between one family and another, draws a compelling portrait of how Japan worked itself out of poverty in the post-war period into glittering prosperity, and subsequently into a kind of aimless and directionless funk in the present day. Wind and fog, pine and birch, horned beetles and stag beetles, slowly rotting windowsills and dirty stucco walls, stairs that creaked with every step, the smell of wood burning in the fireplace, the clink of delicate china teacups on saucers, the laughter of a bevy of lovely women – to Yoko, Karuizawa was a place where these were familiar, established things. The difficult path that these two children end up following after this moment – accompanied, at crucial points of the narrative, by Fumiko – is the simple story that this deeply engrossing and sophisticated novel tells in such a memorable and unusual form.